The Hungarian music community has suffered a great loss. 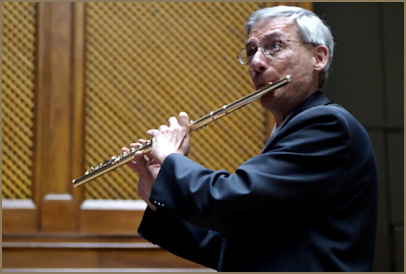 On the afternoon of 29 December in a Budapest suburb, Zoltán Gyöngyössy, world-famous flutist, lost his life in a car accident at the age of 53. He was one of the genuinly outstanding and highly talented musicians of the country. He was particularly fond of contemporary music - there was no Hungarian composer the works of whom he would not play. But he also excelled in performing baroque and classical pieces. He was born 20 February 1958 in the southern Hungarian city of Komló. There he began his musical studies at the Zoltán Kodály Elementary School as a pupil of Klára Apagyi in piano and Mária Révész in flute. From 1972 he studied under the guidance of István Barth in the city of Pécs, and from 1976 with Henrik Prőhle at the Academy of Music in Budapest. His other professors at the Academy included András Pernye, Melinda Kistétényi, István Láng, György Kurtág and Albert Simon. He graduated with honors in 1981. He postgraduate studies were in Dresden with Johannes Walter and Arndt Schöne, and he continued his education in Paris as a scholarship-holder of IRCAM (Boulez Institute). From 1981 he was teaching at a professional school in Győr, and from 1984 he joined the Győr branch of the Academy of Music. In 1988 he commenced to teach at the Béla Bartók Secondary School of Music in Budapest. From 2001 he was teaching at IRCAM in Paris and was invited as professor by the Pécs University as well. From 2008 he was leading the flute specialization program at the Academy of Music in Budapest and from 2009 he was heading the flute department. He was actively working with numerous orchestras. In 1986 he was flute soloist with the European Chamber Orchestra under Claudio Abbado, and also contributed to the Budapest Festival Orchestra during the time of its foundation. In the city of Szombathely he was regularly participating at the modern music weeks lead by Péter Eötvös. In 1993 he toured Vienna, Berlin and Frankfurt as soloist with the Ensemble Modern. He was also a member of the Ensemble Intermoduláció. He made many recordings for Hungaroton and BMC, including works by Amtmann Prosper and Mozart with pianist András Kemenes. He was decorated with several awards from Artisjus. In 1993 he was awarded the Liszt Prize. He was a favorite performer of György Kurtág - as the composer used to mention. His pupils adored and respected him. In recent years he spent several weeks teaching in Sapporo, Japan together with pianist and organist István Lantos. His summers were filled with courses, but he never failed to find time for the music-city concerts at Balatonlelle, where he would perform with István Lantos and myself. The accompaniment could be cembalo or organ - he would play magnificently in either case. He belonged to my closest circle of friends, which also includes István Lantos and tenor Ernő Tálas; the four of us having performed together regularly throughout Hungary for more than a decade.